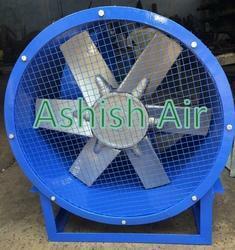 "Ashish Air" Make V Belt Drive Axial Flow Fan. We have specifications like V Belt Drive arrangement. Impeller, which gives smooth functionality. Aluminum Axial Flow fan impeller dynamically balanced, 6 blades, V belt arrangement casing. 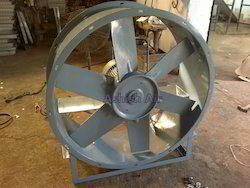 Man Cooler Fan type casing of MS, 37X37X3 angle ring, with the base to make overall height of 6 feet, casing compatible to install 1 HP/1440 RPM MS Base structure, Plastic Heavy Wheels to make fan movable at a different area. It is dynamically and statistically balanced & complete Painted. Bird Screen to be provided for safety. We are leading supplier of Wall Mounted Industrial Exhaust Fan. We produce and supply Axial Flow Fan for applications needing clean air at low pressure and can be the most cost-effective choice our clients can opt for. Yet, for large fan necessity, requiring high rating motors, the enhanced efficiencies are accessed by centrifugal fans which greatly reduce the operating costs. 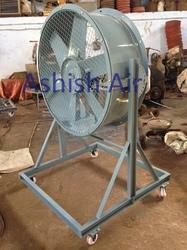 We manufacture a wide array of Axial Flow Fan to suit the varied needs of clients. 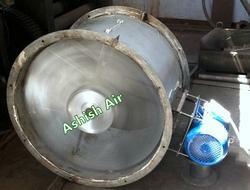 Our direct driven axial fan facilitates the impeller that is mounted on the motor shaft, to the belt driven axial fan. Our impellers are aluminum die-cast with adjustable pitch blades possessing aerofoil section. The impellers are statically and dynamically balanced adhering to norms. The casings are made from heavy gauge steel sheet. FRP inlet cone and Galvanized outlet diffuser are equipped to improve the efficiency. It is also known as Tubeaxial Fans, Axial Flow Fans, Axial Fans. 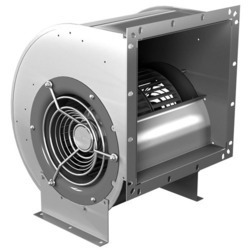 We manufacture and offer a wide array of Centrifugal Fan to fit any number of industrial applications. Centrifugal fan impeller designs made by Ashish Air consist of SWSI, DWDI, Material Handling Fan, Pressure Blowers, Process Fans and High-Temperature Fans. We quality test this range on varied parameters with the help of our quality control unit, before delivery to our customers. This range is offered at reasonable rates to clients. Looking for Industrial Fans ?